Calling all moms with little ones! 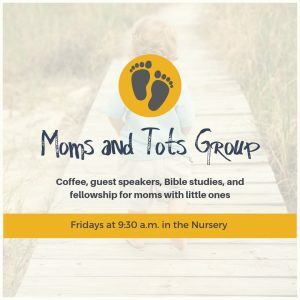 Let’s get together with other moms on Friday mornings for coffee, faith, fellowship, guest speakers, and more! If you know a mom who would be interested in joining, please invite them. We will meet in the nursery after the Friday 9 a.m. Mass. Please share this invitation with families in our parish. March 1: presentation by Brenda McSween, sleep consultant with Parenting Solutions, followed by a Q&A for all your sleep questions. March 15: Do you have any burning questions about the Catholic faith? Join us at this Q&A session with Fr. Pilmaiken. Submit your questions (they will be kept anonymous) by March 1.